Over the next two weeks as I anticipate Sturgis 2013, I will be republishing some of the articles written during my road trip during Sturgis 2012 and the cross country solo ride that took 5141 miles for me to complete. I rode a 2008 Roadking Police that was pretty customized. Below is my mile tracker from the start of each day. The route took me from Boston to Niagara across the mid west from Detroit to the Harley Museum and eventually to Sturgis. After that I kept going through Yellow Stone to Jackson to Oregon and then down the coast to LA. It was a long trip but truly life-changing. Excuse any and all typos as these entries were largely written on an iphone during food and beer stops. I’ll have all the entries dated based on the initial writing. August 19, 2012 Was the last day of the ride. 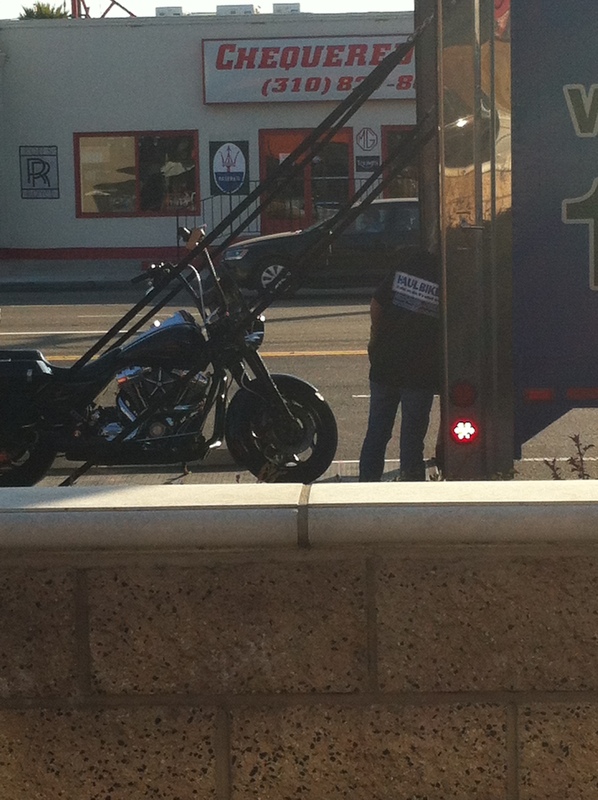 Sadly the picture is loading my 2008 harley road king police bike onto a truck for it’s lonely ride home.